To accompany the Hybrid rebrand of restaurant chain Fasta Pasta, Enoki were engaged to create a statement design for their new store in Rundle Place. Designed to attract working professionals, the new store incorporates a fully licensed bar alongside the signature pastas and pizzas for which Fasta Pasta is known. Their corporate colours were translated into a bold tiled pattern, featured on floor, hob and splashback surfaces. The tiles are accompanied by the warmth of American Walnut and robust nature of Pietra Grigio marble. Clad bulkheads complete the shop front, defining the two service zones. 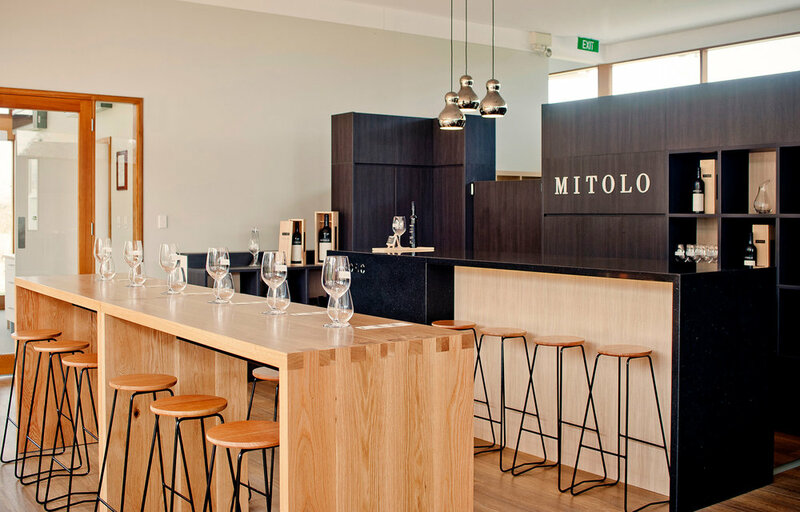 Located within the existing Tree & Vine Company, the new Mitolo Wines cellar door is a combination of clean lines and warm, robust materials; characteristic of the Mitolo Wines brand. Storage and service were essential requirements, with product display at the fore front. 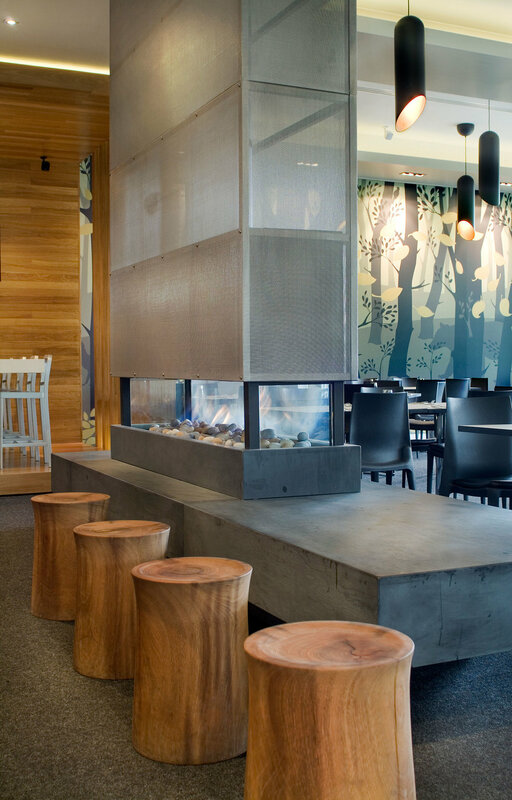 Enoki designed custom tasting tables, crafted by Gareth Brown, accompanied seamlessly with locally made stools. 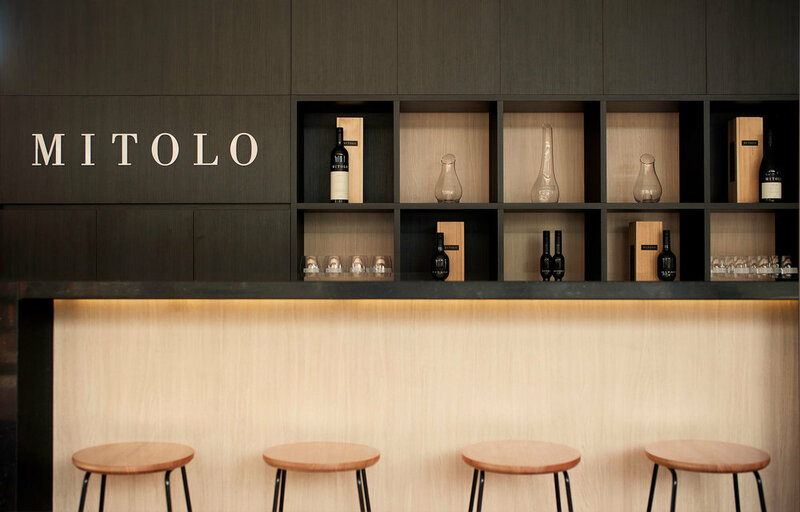 In an interior and graphic collaboration, the Enoki team were engaged to create the corporate identity and signature look for Siroc Espresso Bar. With a clean contemporary approach to materiality and form, Siroc sits in the centre of Blakesview Shopping Centre; a spot for shoppers to pause and enjoy a beverage. Surrounded by communal seating, the espresso bar is clad with Carrera marble, feature tiles and timber veneer, whilst above hang Tom Dixon pendants. The signature black, white and yellow logo creates a bold signature, easily identifiable with the Siroc brand. Make sure you visit Robin for the best coffee north of the city! Enoki were approached to create the interior and identity for Boy Toy Hair; a new statement salon on Magill Road. Big lovers of 80's pop culture, the clients wanted a funky, professional environment that reflected their lively personality and love of all things pink and black. 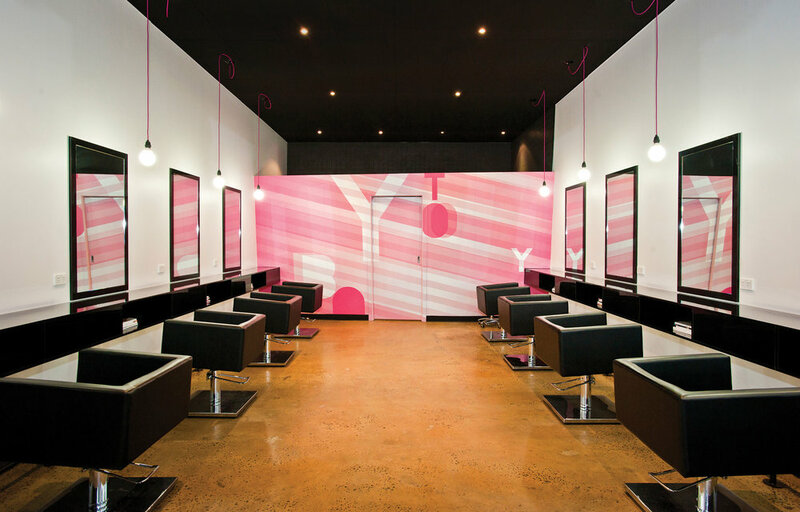 Specialising in high end styling and service, the complimentary space is clean and slick with the use of gloss black on most services and shots of candy pink in retail areas. The use of a subtle perforated metal screen gives privacy to the cutting area and bare bulbs are suspended from pink flex adding a playful element. The Boy Toy graphics are again clean and bold, enhancing the space and Boy Toy branding. Situated amongst a bustling hub of establishments, Tasca Viva provides a distinctive Spanish oasis for devouring tapas and sipping sangria. Upon first inspection it is an eclectic combination of finishes and fittings, yet this space is layer upon layer of complementary ideas. When open, a garage style awning window folds up, allowing internal and external dining areas to combine. Unique patterns and motifs sit comfortably next to one another; from columns clad with hand painted tiles to custom suspended ceilings with back lit laser cut designs. Humour and light-heartedness is communicated through custom graphic work, such as the main entry wall and amenities signage. A sense of warmth is ever present, through terracotta tones and the notion of hand crafted. Enoki was engaged to give Wakefield Plastic & Reconstructive Surgery's waiting room, reception and consult rooms a 'face lift'. The result - a refreshed interior featuring bright hues of yellow, green and blue, set against a base palette of white, charcoal and dark timber. Within the waiting room, custom seating sits comfortably against feature wallpaper by talented Sydney based textile team Sixhands. Each consult room was given a signature colour, introducing a playful quality to what is typically classed as a clinical environment. Enoki was approached by the owners to design both the identity and interior environment for this group of high-end retail shops. The design concept provided for a clean and simple environment focused on handmade pasta products. A bold and unique typeface was designed for the logo to create a memorable and timeless brand identity. Enoki commissioned photographer Mike Annese, of Blink, to capture the pasta making process, and these black and white images were enlarged and mounted as wall murals throughout the space. LED lighting, contemporary classic styling, Eco-ply joinery, timber-look porcelain tiles and dark coffered ceilings all come together to create a dramatic, engaging and almost museum-like atmosphere. The Haus Café Bar Kitchen in Hahndorf is an establishment created for patrons to devour and enjoy the very best of local produce within a multipurpose surrounding. Giving reference to Hahndorf's unique past in a contemporary context, Enoki worked with Anni Luur Fox to create six stories depicting the life, food and culture of the area's first settlers. 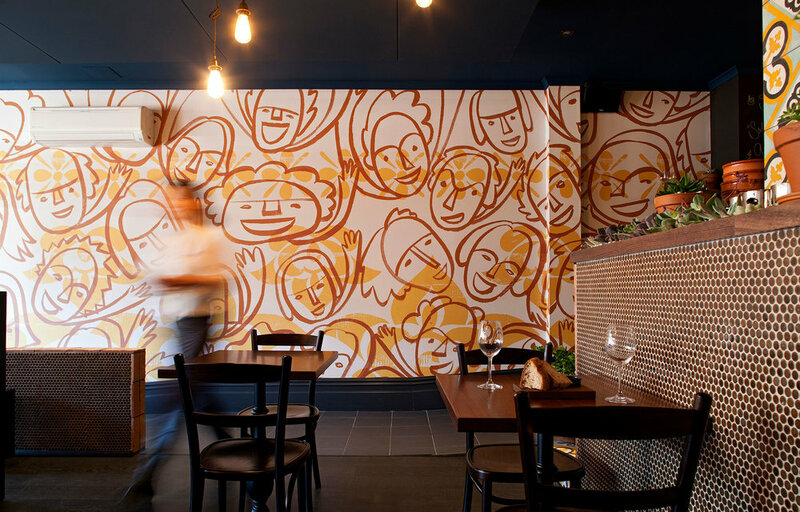 These stories were converted into illustrations, which adorn the walls to tell a visual story and assist in creating different zones within the establishment. 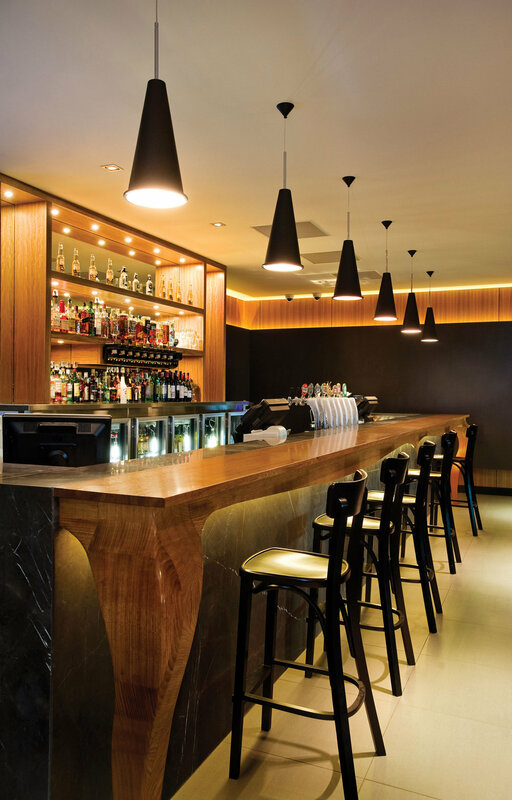 The third stage of the Belair Hotel project, the Belair Front Bar is divided into several areas catering to a variety of clients. 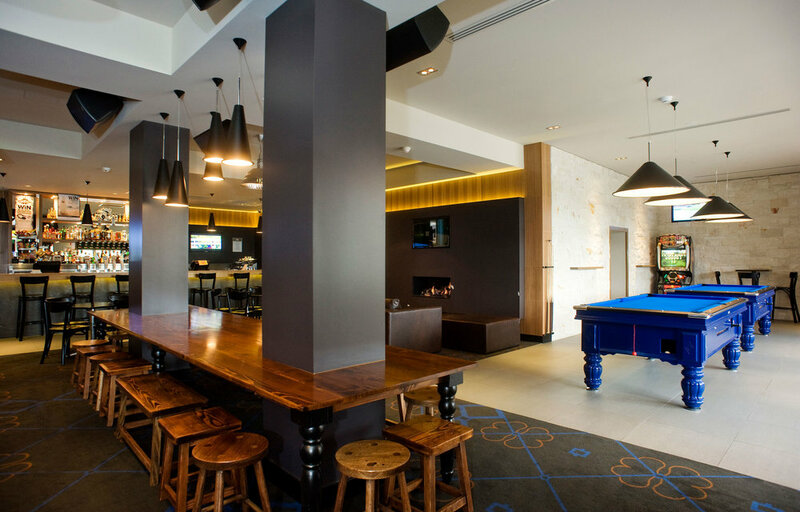 Featuring a large outdoor area, bar, pool tables, lounging and amenities, the design emanates a saloon feel without being cliche. 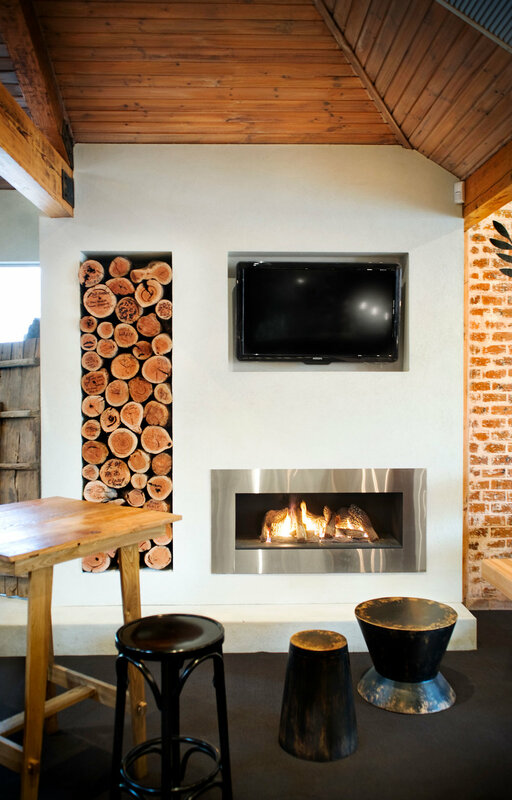 The walls, covered in a combination of timber paneling and a dark paint colour, along with two fireplace areas, create warm and private settings within a larger space. The front bar references bygone times, with a marble front and legs reminiscent of a horse's hind legs. To reflect the client's commitment to customer appeal and quality service, the Belair Hotel called for a re-interpretation of their establishment through a strong aesthetic identity and corporate branding. Graphic imagery was used to delineate specific areas, each having its own character. Dotting the different areas with elements of humour and surprise, the fresh mix of finishes, furniture and lighting provides intimacy and warmth within a free flowing space. This dining room uses a sensitive and subtle play of light, shade and pattern to create a formal yet inviting space. The layouts allow for open, casual areas, alongside intimate, private settings for dining and drinking. This client brief called for an inviting, non typical hospital environment with a fresh, contemporary feel. It also required an upgrade to more durable finishes and more functional spaces. 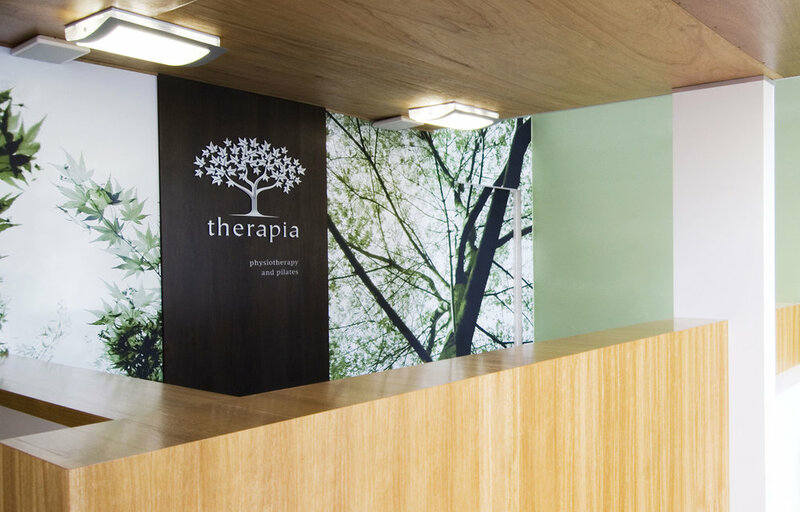 The use of eco friendly, hospital grade vinyl wallpapers and fabrics, improved lighting levels, glass and stainless steel wall cladding and classic seating, all go toward creating an enjoyable and functional environment for patients and staff. Clean lines, strong corporate branding and efficient use of space were the main client requirements for the Mitolo Wines corporate offices. Sensitive to the existing structure, the addition was designed with simple spatial planning, strong, quality-driven finishes and premium office systems and furniture. The outcome was an office environment reflecting the Mitolo style and attention to detail. The project brief called for an environment which reflected the Lana Lang Brand. The client wanted their top end, comfort and function driven footwear to be sold within a fun, yet professional and customer focused environment. The new, larger premises allowed for spacious storage and display areas to work together harmoniously and to interconnect with the point of purchase area, while the increased floor space allowed for more spacious and functional customer areas. The project philosophy is embodied in the user friendly, durable and fun finishes and fittings. 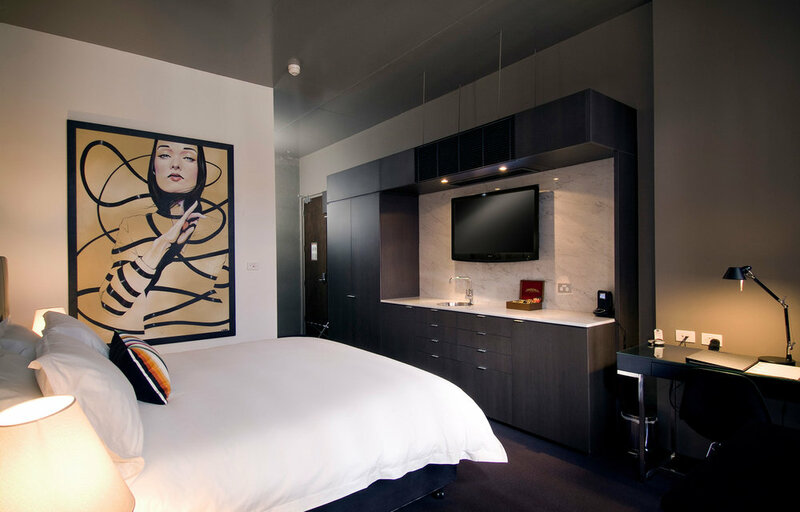 The architect's brief for this project called for a clean and contemporary, 30-room, 5-star boutique hotel, the likes of which were unique in Adelaide. The reception area, with arabescato marble, eco veneers and metal curtaining, introduces the guest to the quality and detail of what they are about to experience. Clients are greeted by rooms that echo the finishes used in the reception area, enhanced by designer seating and lighting, against a backdrop of large, bi-fold windows that open out onto the Adelaide skyline. 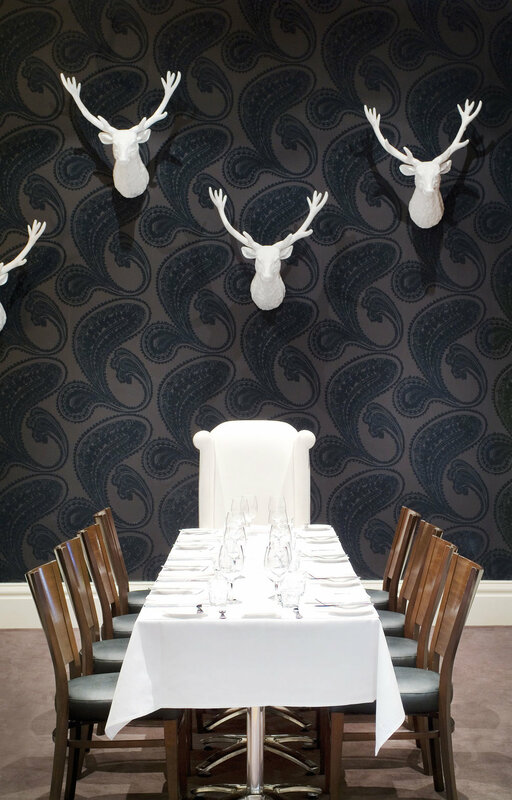 The client requested a classic, stylish and high end dining experience to entice house guests and the general public. With its use of marbles, luxury eco veneers, Missoni fabrics and Tom Dixon lighting, the intimate restaurant provides a perfect backdrop to fine dining and a high end wine list. 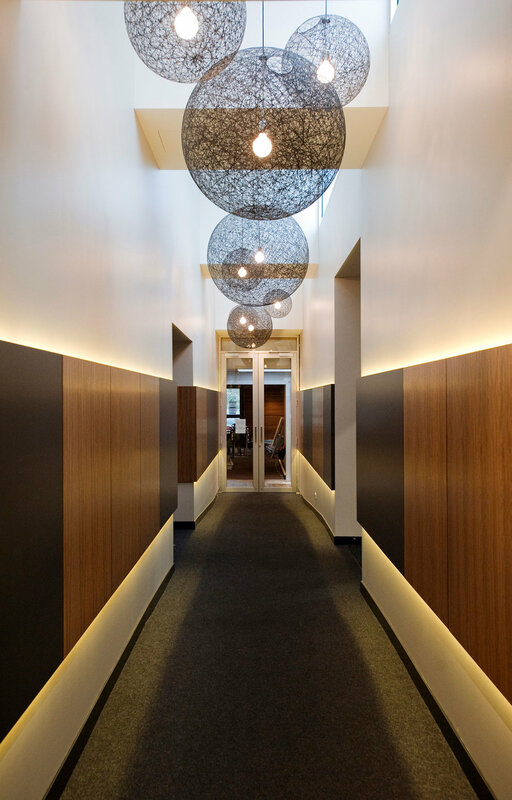 The project team for this job was comprised of the client, along with local architect, Bohdan Dorniak, who specializes in straw bail walls, and Enoki, for interior design, corporate identity package and interior graphics. Calling for a strong environmental focus, spotted gum was used for the floors which wrap up the front counter, recycled plywood for the ceiling lining, and birch Eco ply for doors and joinery. Existing red brick walls were exposed, for their raw beauty, in the reception area and Pilates room, and are juxtaposed with falling leaf wall sculptures of stainless steel. With their dense thermal mass, straw bail walls form the hallway and consult rooms, providing efficient heating and cooling qualities, as well as privacy due to their low noise transfer quotient. All joinery is built in and provides optimum storage and functionality.